You know that one of the hottest topics around the Christmas season is what is the best Christmas movie. I’ve heard radio stations debate it over the airwaves and it’s really a fun argument and discussion. We are ardent Christmas movie watchers in our family. In fact, I’m so weird about it, I’ve established guidelines on when and how to watch certain movies (example – the George C. Scott Christmas Carol must be viewed Christmas Eve night and The Christmas Story is never viewed before Christmas Day, yet can be binged on that day). Not that I’m obsessive or anything…I’ve actually made slight alterations when cajoled by my daughters exclaiming, “Please Daddy!” because they won’t be back home in time. I’m not a Grinch for goodness sakes! I know people have opinions and cogent arguments about their favorites. However, no right-thinking person can argue over what is seemingly inarguable. 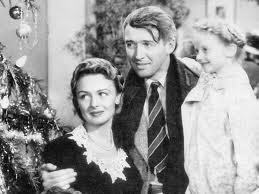 The BEST Christmas movie EVER, and perhaps one of the greatest movies of all time is “It’s a Wonderful Life.” Period. Punto. No mas. Look…the movie has it all. We’ve all been George Bailey at some point in our life. Is there a more compelling character for Christmas? It transcends generations with its story of family, adversity, loyalty, compassion, evil (Mr. Potter is the original Darth Vader), and love. The depth of despair to the adulation. Heck, when you watched Elf and saw Buddy standing over the East River (might have been the Hudson, but who cares) about ready to end it all, didn’t your mind flash back to George Bailey leaning over the edge of the bridge with the snow falling and the agonized and tormented look on his face? of course you did. Me, too. Man on Porch: Why don’t you kiss her instead of talking her to death? George Bailey: You want me to kiss her, huh? Man on Porch: Ah, youth is wasted on the wrong people. Zuzu Bailey: Look, Daddy. Teacher says, every time a bell rings an angel gets his wings. George Bailey: That’s right, that’s right. [Looks heavenward] Attaboy, Clarence. That’s how you know it’s the best! George Bailey: Ha, ha, ha, ha! My mouth’s bleeding, Bert! My mouth’s bleeding! Zuzu’s petals… Zuzu…[checking his pocket] There they are! Bert, what do you know about that! Merry Christmas!